This beautiful large family house and its estate which extends as far as the eye can see is in Gaume, a region renowned for its mild climate. There is something of a Provence atmosphere in Gaume ... It is often warmer than in the rest of the country and there is even a small vineyard here! The house is spacious and perfect for a family holiday. Both rustic and comfortable, you'll never feel cramped. 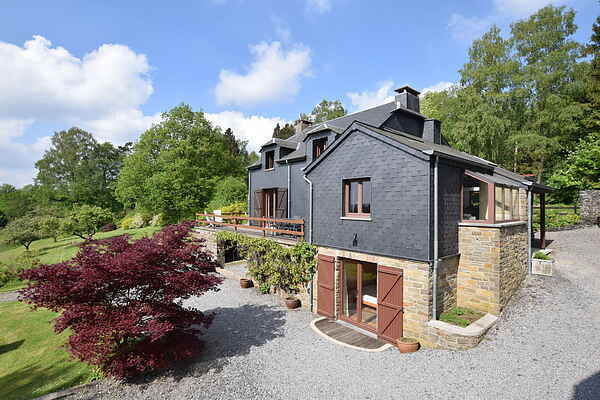 You'll no doubt spend a lot of time outdoors, taking advantage of the huge property: a large carefully maintained garden, a barbecue corner, a field and opportunities for long walks in the woods, without even having to leave the property. The town of Bouillon is twenty kilometres away and well worth a visit, for its history, its leisure activities and its restaurants. In addition, don't miss the typical villages of Chiny (which comes to life amazingly during the "Contes de Chiny" festivities) and Torgny ("Belgian Provence"!) or Orval Abbey where you can enjoy a good Trappist beer! There are two houses on the property. One is the holiday home and the other remains closed at all times. One pet is allowed upon request if not agressive.